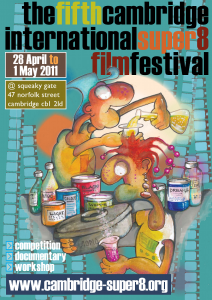 The 2011 festival will take place from the 28th of April to the 1st of May 2011. It will comprise a programme of more than 50 films from around the world ! Chekout the programme of the festival (pdf, Flash)! A two-day super8 workshop will also be held on Thurday the 28th and Friday the 29th of April under the direction of Tony Scott.